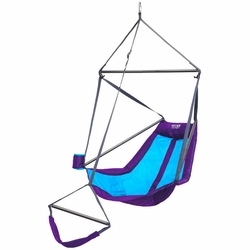 ENO Lounger Hanging Chair. After experiencing the Lounger, you may never want to stand again. Your legs will exist only to hang in the adjustable footrest and the plush headrest will make you forget what it was like to carry eight pounds on your neck. What if you get thirsty? Look to the attached drink holder. Sleepy? Just recline the Lounger and snooze away. Stash a sandwich and a book in the integrated pockets and let the breeze do your moving for you. Eagles Nest Outfitters.